Excepting sittin' fer a spell, at which I excel, spelling has never been my strong suit, or, as it's written in American Phonetic English, "ɛksɛptɪŋ sɪtən fər ə spɛl, æt wɪč ay ɪksɛl, spɛlɪŋ hæz nɛvər bɪn may strɒŋ sut." As a prepubescent mass-transiter I read speed-writing advertisements inside buses: "F u can rd ths, u cn bcm a sec & get a gd jb w hi pa!" I could read it and looked forward to becoming a sec and getting a good job with high pay. I had little idea what a secretary was but the prospect of earning fabulous wealth as an office peon was compelling, and, until last week, continued to be so. 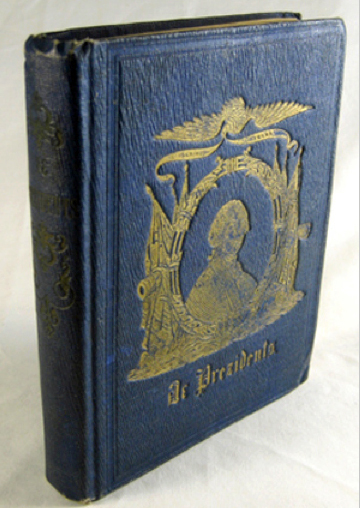 Then I discovered a rare old book and learned that I cd bcm prezident of the Yunited Stats f ownlee I cd spel gd. Immediately, sec dreemz wnt owt th wndw as I cntmplted gdding a gd jb w hi pa bi bcmng a politico. 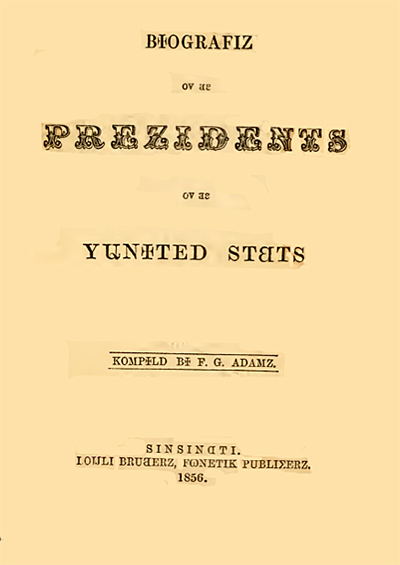 Biografiz ov th Prezidents ov th Yunited Stats, kompiled by F.G. Adamz and published in Sinsinati, Ohio by Lonli Brutherz, Fonetik Publi∑erz, in 1856 is my bible. 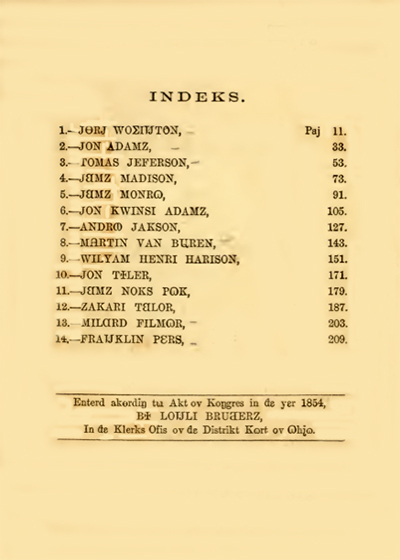 bi Loijli Butherz, In de Klerks Ofis ov de Distrikt Kort ov Ohio. Containing biographical sketches of all U.S. presidents from George Washington through the date of publication - Franklin Pierce - it is written in phonetic English, which the compiler employs so that immigrants can easily learn the language and assimilate. Politics enters into it; the nativist Know Nothing [American] Party earns a clop on the noggin in the Preface - written in standard English so that readers can get through it without screaming as they run out the door and race down the street in hasty retreat from assault with a deadly shorthand. Included, thank you, is a chart of the author's phonetic alphabet of the English language. After perusing it, immigrants were expected to resist the impulse to book return passage to the Old Country, pronto (prntow), in a row boat if necessary. I'm an American English speaker since birth yet after reading the chart I'm ready to renounce my citizenship and flee to whatever nation will take me, no matter the language. Ixnay onway ethay ackowhay Englishway ellingspay, y'know hwot I mean? 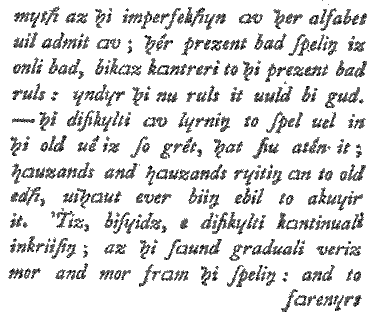 If not, I invite you read the opening text to the bio of George Washington, er, Jorj Wo∑injton. I got as far as George's dad - "He woz an ekselent fader" - and then began to hear Hello Muddah, hello Faddah (here I am at Camp Grenada), the novelty song from Allan Sherman's 1962 hit comedy record album, My Son, The Folk Singer. The cherry tree story, phonetically spelled. Three pages and a migraine later, I encountered the story of George Washington and the cherry tree. Afterward, I chug-a-lugged a jug of kirschwasser 'cause only a gallon o' cherry brandy could allay the oy vey. The whole story spelled trouble, phonetically or otherwise. 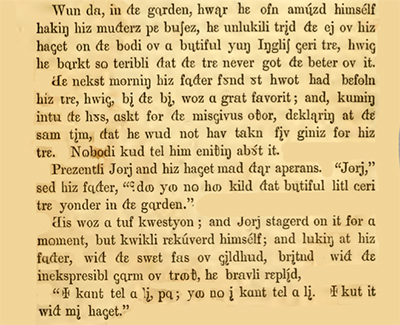 "I kont tel a li, pa, yoo no I kont tel a li. I kut it wid mi hacet," said George, who, unaware that a weird diacritical mark was necessary to pronounce "hatchet" from "hacet," left his fader in the dark. "A hacet, Jorj? Hwot the hell are you talking about?" 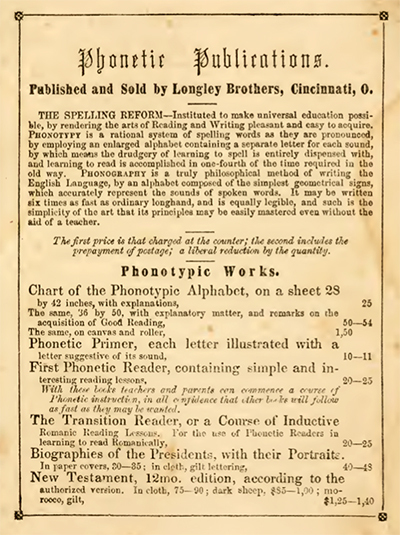 Phonetic spelling systems for American English have been around since Benjamin Franklin, who, in 1768, wrote A Scheme for a new Alphabet and a Reformed Mode of Spelling in which he proposed a phonetic system for standardizing the spelling of English. 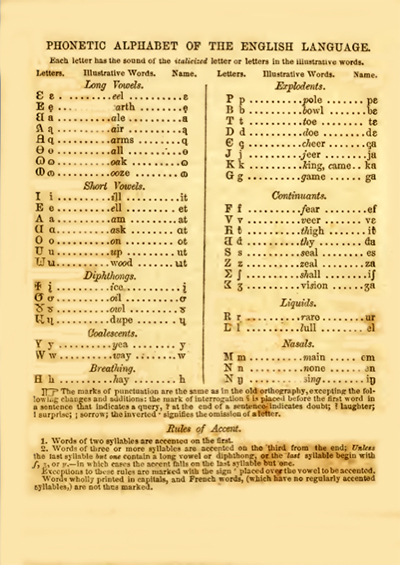 The alphabet was later published in Franklin's Political, Miscel­laneous, and Philosophical Pieces (1779). Sample of Franklin's phonetic system (1768). varies more and more from the spelling: and to foreigners." Suddenly, F.G. Adams' phonetic system of spelling seems as clear as can be; Franklin should have stuck with electricity. N.B. : As one who once spent a New Years Eve in a grueling six-hour game of dueling homonyms à deux, the thought of phonetically spelling and then trying to distinguish hew from hue is too much to bear - or bare. ADAMS, F.G. Biografiz ov [the] PrezidentS ov [the] Yunited St[a]ts. Kompild By F. G. Adamz. Sinsinati [Cincinnati]: [Longley Brothers, Phonetic Publishers, transliterated from phonetic], 1856. 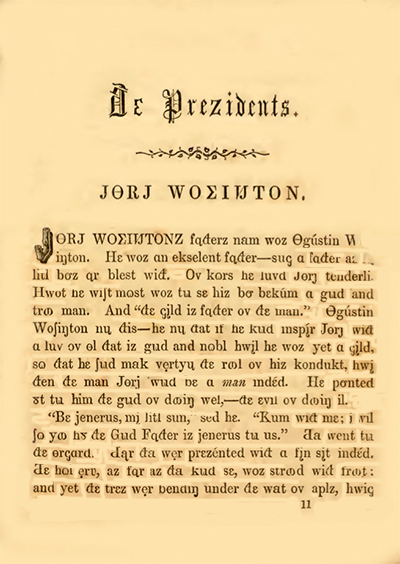 Second edition (first in 1854). Small octavo. 219, , fourteen woodcut illustrations. Gilt-pictorial blue cloth. Many thanks to Garrett Scott Bookseller, currently offering this item.